The fourteen year old artist from Republic of Moldova, Valeria Duca, took part last week in an important annual exhibition in Italy. There she was selected to show her works at the international contest “Don Quijote and the South American Independence”. Meantime, another opening of her personal exhibition took place at the well-known art gallery “Amarillo Art” based in Reggio Emilia, Italy. There, Valeria presented twenty five works, which were highly praised. The Italian publication “Il Resto del Carlino” talked about the influx of people that showed up on the 28th of November at the opening of Valeria Duca’s exhibition. I quote “an artist from Moldova, with a genuine, inborn talent, who at only fourteen has become a name on the international art scene”, with five personal exhibitions and twelve group exhibition. In Italy, the artist was discovered by Mario Alvarez, the director of the Amarillo Gallery, who met Valeria during the Giochi del Tricolore. The opening evening opened with a tango performance, executed by Gianni Gilberti and Emanuela Valentini, followed by the splendid voice of the soprano singer Elisabetta Gurioli and the poetry interventions of the writer Giacomo Borgatti. The poet was inspired by the works of the Moldovan artist, which Valeria so thoroughly spoke about to those present at the event. The opening evening was organized by the “Amarillo Art” Gallery. During the same time that the personal exhibition took place, Valeria Duca also took part in the annual exhibition of contemporary art “Fiera d’Arte Contemporanea “Immagina” of Reggio Emilia. The art fair took place between 26th and 30th of November, arousing the appreciation of numerous art consumers. Over eight hundred people took part in the art fair, their works being included in an art catalogue. Valeria was the youngest participant at the event. Furthermore, she was selected to take part in the contest for the International Award “Don Quijote and the South American Independence”, a contest promoted by LiterArt, the European Association of Literature and Art, the Bicentenario Group and Amarillo Art, in collaboration with the embassies of Argentina, Bolivian, Spain, Chile, Columbia, Ecuador and others. In addition, the monthly magazine of art and culture “Arte”, edited by the famous publishing house “Mondadori”, has included two of Valeria’s works. Valeria told us that this experience meant a lot to her: “First of all, because it is so interesting to see all the works – a diversity of styles, from hyper realism to the very abstract. There was sculpture as well. It’s all very new to me and very interesting”. In Italy, Valeria has received multiple proposals for further collaborations. Meanwhile, she will take part in the National Championship of Taekwondo. She is also a successful athlete, being three times a national champion and twice declared the Sports Woman of the Year. On the 1st of February, Valeria will open another exhibition in the Palace of Parliament, in Bucharest. 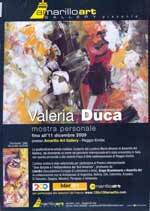 The case Valeria Duca is a lesson for the art authorities from our country, who could do more to promote the young talents at home. It is very often the case that the talented youth finds support abroad, in other countries, while at home, they are rejected.